Balmain Hair is a part of the French fashion house Balmain, founded in the fifties by the renowned couturier Pierre Balmain. Recently, the prestigious fashion house has appointed the rising fashion designer Olivier Rousteing as their new chief designer. He regularly designs stylish red-carpet outfits for stars like Gwyneth Paltrow, Kate Hudson, Celine Dion and Audrey Tatou. His autumn / winter collection 2012 was widely praised for his refreshing new style, with the traditional elegance of Pierre Balmain in the mind. Rejuvenating pure organic serum Gives an instant boost Creates a smooth and healthy look. ..
Refreshes hair for that 'just washed' look Soaks up excess oils and cleanses scalp Le.. The perfect Leave-in conditioning spray suitable for all hair types. Conditions hair and scal..
Revitalizing and nourishing conditioner, enriched with pure organic Argan oil. Repairs..
Moisturizing Shampoo is a deeply nourishing shampoo, enriched with pure organic Argan oil. Su.. Intensive treatment hair repair mask, enriched with pure organic Argan oil. Restores d..
se for shaping for moveable and workable hold. Long lasting control Medium spray.. High-performance styling spray Use for controlling, fixating and finishing. Long Lasting Cont.. Backstage secret! Specially formulated to provide a lightweight silk finish, infused ..
Vapourizer for Silk Perfume. Silk Perfume must be purchased seperately. .. Gives texture and body to hair Create gorgeous beach waves One of the backstage tricks for.. 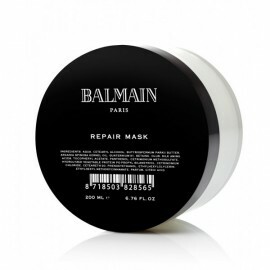 The Balmain Volume Conditioner a nourishing, caring conditioner. The volume boost creates&nbs..
Volumizing styling foam Conditions and repairs damaged hair Versatile styling without comprom..